went into production in April 1990. It is the second generation of the original S-6 design. Increased wing span through a fuselage re-design resulted in improved performance and appearance (ES denotes "extended span"). The Coyote II design goals represented a significant advance in terms of low build times and a surprising number of airframe configurations. With the high level of finished parts, build times average between 350 and 550 hours. A Coyote II can be built in the confines of an average double car garage. Basic shop tools nd skills are all that are required to turn out an attractive, well made flying machine. In the beginning the Coyote II was a plane that can be shipped in a couple of small crates to anywhere in the world, and be built in a manner of days. Because of this, the Coyote II was a game changer, and it populated countries that were new to private aviation, and places where new legislation opened up the skies. 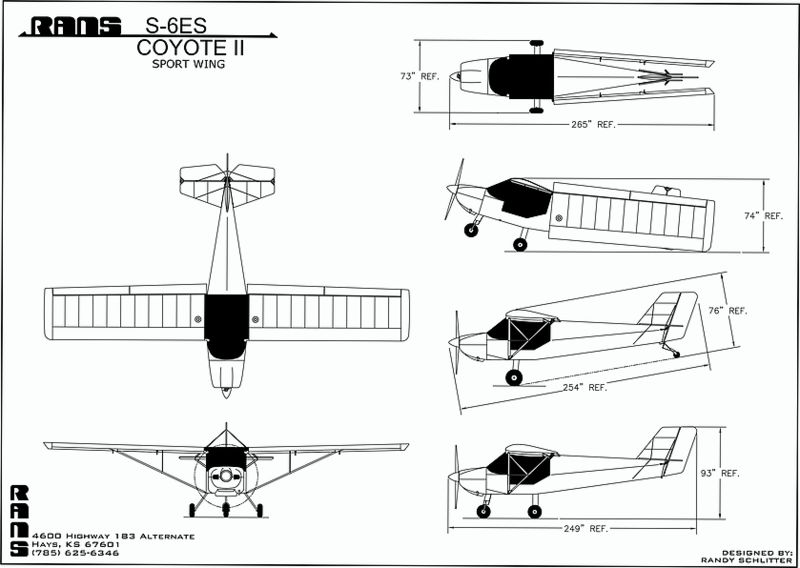 Accomplished at winning awards (five time world Micro Light Champion)d epic flights (Coyotes have flown the Atlantic, and from Australia to Belgium), the 2017 S-6ES Coyote II continues the legend of this innovative plane. t still ships in compact form, and builds in a record time due to the high level of pre-fabricated and finished painted parts.